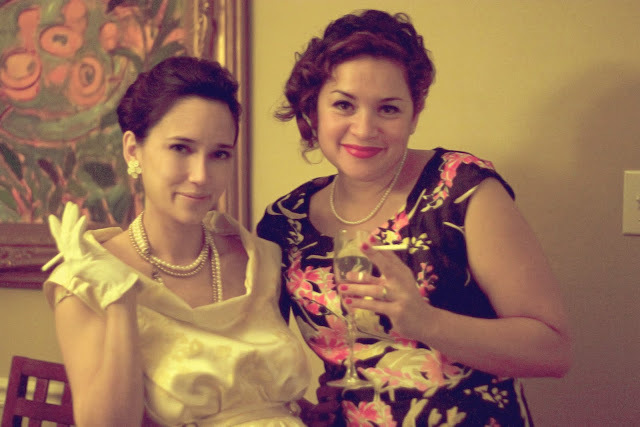 Grosgrain: The "Betty Draper" Evening Gala Maternity Gown GROSGRAIN GIVEAWAY!!!! CLOSED. The "Betty Draper" Evening Gala Maternity Gown GROSGRAIN GIVEAWAY!!!! CLOSED. When I learned that Betty Draper was expecting another baby I wondered how they were going to keep her glamour. Whenever I saw maternity clothes from the 50s and early 60s I was less than impressed. Very tent-like. Not many details. When I saw the costume designs on Mad Men I was so very impressed. Yes, she still looked fabulous. Of course, her beautiful face didn't hurt but (speaking as a pregnant woman) her clothing was actually enviable. So when my friend Cheila announced that she was having a 50s themed New Year's party, the wheels in my head began to turn. Looking back, if I had more time and energy I would have done something with a little more detail. But in the end I was more than pleased with the look. I found the material for only $2 a yard. It was PERFECT. I noticed that a lot of the dresses from the 50s look more like upholstery fabric now. Very heavy and brocade. The only thing I would have changed was the color. Originally I was looking for something a little more pink and gold. You might have a hard time telling from the photos but the dress is yellow and gold. I cinched it just below my bust line with a matching rounded tip band and two antique yellow and gold buttons. The neck line is finished with a slight cowl look. i left the arms sleeveless because it just looked more dressy that way. I found the earrings at an antique store for only $2 and the surprising part is that the flowers perfectly match the flowers on the dress. What a find! I also found the gloves at another antique clothing store for only $3. I really lucked out! They are so adorable with a little button at the cuff. They are ALSO included in the giveaway! I also didn't get a picture of it but a friend of mine lent me an authentic 50s fur wrap. So when I walked in the door I was about as 50s as I could have possible hoped to be. Brian also really went all out and looked the part! He found the three piece suit and skinny tie at the Salvation Army. He bought horn rimmed glasses for the occasion and I quickly serged the pocket handkerchief before we left. I always look for a reason to dress up. I only wish I had more reasons. It's hard to get enough people together who A. want to dress up and B. have the time and resources to do it right. The hosts, Cheila and her husband Nate, did a fabulous job with their theme. 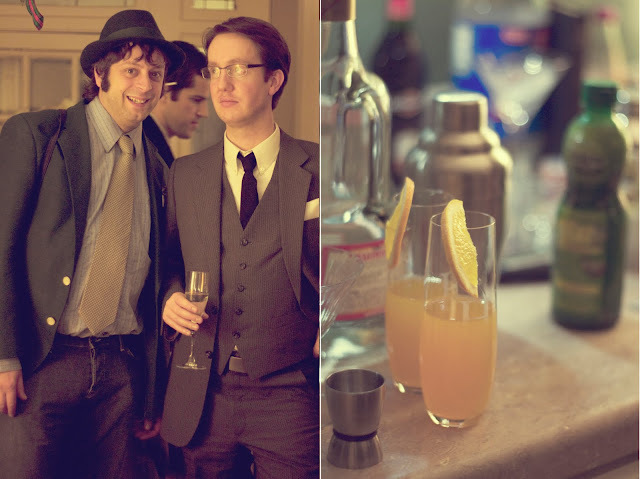 We had 50s cocktails (well, not me) cigarettes (candy) and plenty of hors-d'oeuvres. In true Betty Draper style I smoked about two packs of (candy) cigarettes and had about two (virgin) cocktails. Cheila asked that the guests bring the ingredients for their favorite drink. Sort of like a cocktail potluck. We brought the ingredients for a gimlet, basically one part lime juice one part gin. I think Betty ordered one on Mad Men once. I would say that this dress would fit a medium. However, I am pretty late in my pregnancy so it really depends on your stage. You can sort of judge from the photos. Gorgeous!!! And, I find myself pregnant again...Happy day! How cool would it be to win this pretty little number?! You are gorgeous my friend. I saw some of these photos on facebook and can I just tell you that I'm green with envy that you had such a fab party to attend! I love it all. Thanks for sharing it with us all and (as always) what a generous giveaway :). This is a gorgeous dress. Oh this turned out so beautiful! I love the dress and you in it. That is beautiful! Thanks for the giveaway! This dress is delicious! I love the fabric. Looks great on you! I've been looking for form flattering maternity dresses with elegance~this is it! Wow! Too beautiful for words! it turned out WONDERFUL i absolutely adore the dress! Thanks so much for another great giveaway. Very pretty. Crossing my fingers that I'll have a bun in the oven sometime soon (and thus have a need for this beautiful dress). But you looked amazing in that outfit, and I declare it a particular success! absolutely gorgeous!! What a beautiful dress!! 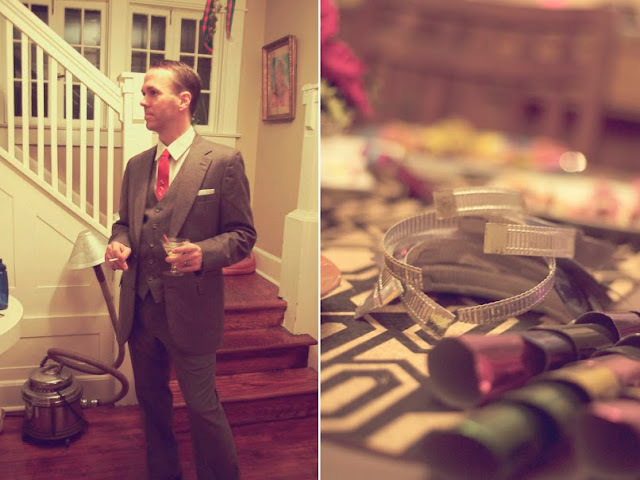 love the theme, too, I <3 Mad Men!!! Oh, wow, this dress is a piece of art. 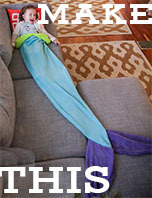 Great make-believe for grown-ups Kathleen! That dress is killer, and you look amazing in it! Wow! You even look exactly like a brunette Betty Draper! Gorgeous! Don't you love that show? It's a definite fave of mine. So fabulous! LOVE love it!!! Hope i win!!!!!!!! Beautiful! I just found out I'm pregnant and would love to win this! Crossing my fingers!!! What a beautiful dress! The earrings and gloves just make that outfit perfect. Love it! Very beautiful dress and picture.. Awesome Dress! 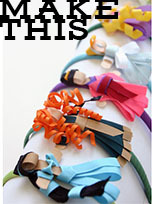 Wish I was this crafty! This is just beautiful! I would love to wear this dress to my baby shower! Please, please let me have a lucky start to 2010 and be the winner of this GREAT dress. I hope I look this great when I'm pregnant! The dress is also beautiful! I don't want to enter the giveaway as I am not pregnant and do not want to deprive some radiant pregnant woman this absolutely gorgeous dress! But I had to say I am a huge Mad Men/Betty Draper fan and I think you captured the era and the elegant glamour just perfectly! You look incredible- the hair is perfect too! Well done! I am, as usual, so impressed! Wow! I can't believe you just whipped that up for a party! And honestly you don't look 'late in your pregnancy'. You look like you are about halfway through! I am about 6 mths pg and would love to wear this beautiful dress. Thanks for another great giveaway! wow! Makes me wish I was pregnant...and young...and beautiful. I am just speechless at how beautiful this dress is. Wow! Really inspired me to get my machine back out. Gorgeous. Gorgeous. Gorgeous. Thanks for the giveaway. Very generous of you. You look gorgeous in this dress! I'm 4 months pregnant and would LOVE to have this to wear to a wedding this spring ... it would be perfect. Ah dress-up! I promised if I had a child I would have a big dress-up treasure-chest. I did and I did and now my eight-year old is hooked. Today he is James Bond in a suit and tie. You looked fab. I loved the details. I will link and should I win I will give the dress to my friend who is pregnant. Ah dress-up. I swore if I had a child I would make them a dress-up treasure chest. I did and I did! Now my eight year-old is rarely himself! Today he is James Bond in suit and tie. I will link and if I win I will give your gorgeous creation to my friend who is pregnant. You look fab and I love the details. This is beautiful! I am pregnant and only wish I had your talent to make myself look as cute as you do! you are one beautiful pregnant woman!! i would love to win this dress as i am in the early stages of my pregnancy and could hopefully wear it for a long time! i love your blog and think you should come out with a book. I'm currently trying to get pregnant and would love this outfit as something to look forward to once my belly starts growing! Beautiful outfit, as always! So lovely!! I would love to win! the dress turned out so beautiful!! 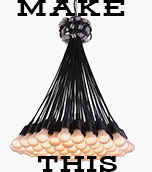 I was wondering if you'd ever be willing to write down some basic instructions/patterns for you creations, they are gorgeous and I'd love to buy patterns for them!! This is an absolutely fantastic dress! I am 7 months prego with my first, and I love that you are doing a MATERNITY give away! Hooray! Just stumbled upon your blog and love it!!! I have been looking at older posts and have a whole page scribbled down with ideas to try for my almost two year old daughter! 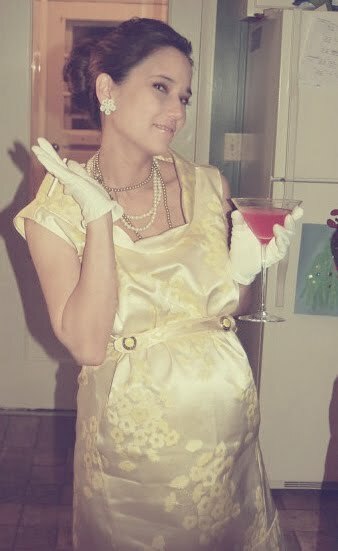 LOVE the maternity dress - would love to make one for my sister who would have fit perfectly in the Mad Men era! I'm desperate to find a dress to play a piano recital in while 6 months pregnant! This is adorable, I've enjoyed looking at your maternity dresses! Oh my goodness! I love this dress so beautiful! What a great time to offer this since I am pregnant! What a beautiful dress! I would be honored to have such a prize! Love it. Would so so so wear it. This dress MAKES me want to have another baby. Seriously, so cute. And you look fabulous! I love this, it is so imspiring! I've linked to my blog! Such a stunning dress! You guys are a gorgeous couple. Congratulations! i'm pretty sure i would wear that dress everyday if i looked that good in it, PREGNANT! you look beautiful! and i wish there was SOME way i could just download your mad sewing skills into my brain! Wow. This dress is amazing. I'm newly pregnant with #3 and have never been thrilled with my pregnancy wardrobe. I would be delighted, however, to outfit my soon-to-be big bump in your gorgeous dress. I have visited your blog for a while now and am amazed at your work. Thanks for sharing. I just wanted to comment and say that you make pregnancy look downright glamorous! The dress is beautiful, and the 50s theme is just fabulous. Fabulous. I'm pregant and would love to sport this dress. Truly lovely. I was just thinking about researching vintage maternity pieces that aren't tents. Lovely lady! You look fabulous! 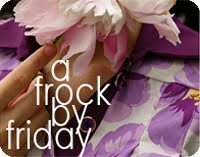 Find more opps for dressing up; people don't do it enough anymore. Hope you, dad, and the wee one are doing fine today. You're adorable! I love that dress! 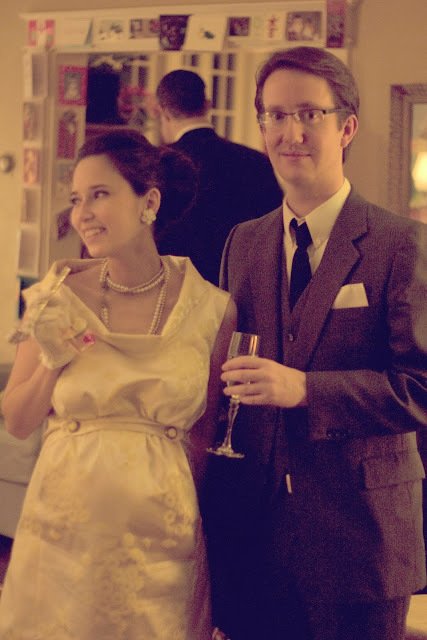 I was a 50's housewife for Halloween, but my costume was about 1/10th as impressive as your dress, no, more like 1/100th. I also love how the pictures are slightly diluted and very vintage looking. Way to stay committed to the theme! count me in on the giveaway! Its beautiful! just stunning, so classy! How perfect with my second trimester of a first pregnancy approaching! I think the weather would be devine by the time I could fit this! BUT haven't announced the news yet and don't want to let it out of the bag as of yet! Beautiful dress! I'd love to win it. I think it'd be awesome to wear for maternity pictures- which I'm having taken in mid-February I've linked! Wow, as always, just stunning. Makes me wish I was preggo again. You look gorgeous and that dress is SO dead-on Betty Draper during her pregnancy. You nailed it. That party looked like a blast! What a beautiful dress! 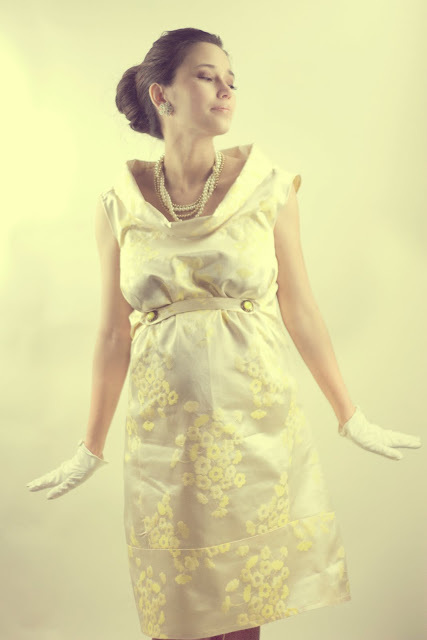 And I so love vintage clothing (or more, vintage looking, haha). I would love to have this to wear with my soon to be large belly! I made a blog post about this giveaway with the link! Wow I love it...you are so super talented! And you look absolutely stunning, dress, hair, face, gloves, jewelry and all!!! Wow! Love the dress! and perfect-I'm 5 months pregnant!! I love looking at all your gorgeous creations. Thanks for doing them! This is beautiful! I am almost 4 months and I need a cute dress! Love it!!! I love this dress! you are a style icon! I love this, and am newly pregnant again, so I could put it to good use! What a great dress. I'm in month 7, so it should fit perfectly very soon! I was just wondering when this giveaway closes? Woo hoo! I'm just at 28 weeks! Oh I hope by some miracle I win! hello there, i am new to your b log and just have to tell you that you are absolutly gorgeous. and i am in love with this dress! and i am not even prego. i just think it is so gorgoues. Beautiful dress, I hope to be pregnant soon and this would be perfect for my Sister-in-law's wedding rehearsal! I would wear this dress every day! high five. it (and you) look awesome. What a beauty!!! She is so gorgeous you know. I love her beautiful top.